Solid functional construction in good condition with wear and patina to wood surface. Beautifully kept oiled white oak dresser with unique pull handles and woodwork. 2 available. 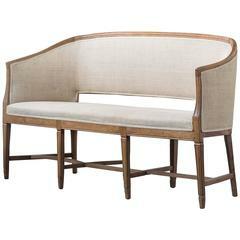 Oiled beach wood frame with burlap style fabric on a beautiful example of an early 19th century, Danish canape. A beautifully preserved tall dresser with a stained beach skeleton and facades of mahogany. 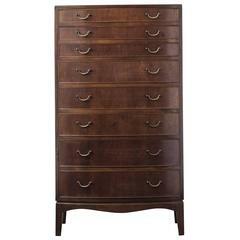 Curved front with eight brass drawer pulls. A very charming early 19th century painted commode from Northern Italy. Terrific finish and texture.